Hello again! First of all may I just say this new website is looking snazzy! Thanks for all the hard work that has gone on behind the scenes! In recent years the term ‘super car’ has become all to common. The performance and specifications of most modern high performance exotics can easily land them into the category of super car. 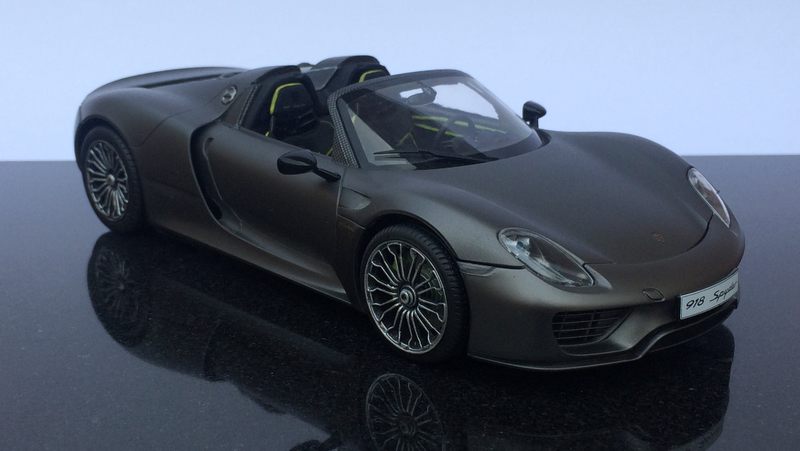 So it’s fair to say we needed a new category… This is Porsche’s first ‘hyper car’, the 918 Spyder. The kit itself is from Revell in 1/24 scale. It is quite a decent kit, but it’s not a Tamiya… I read a review in a magazine when it was first released claiming that it was easily Revell’s best car kit so far. 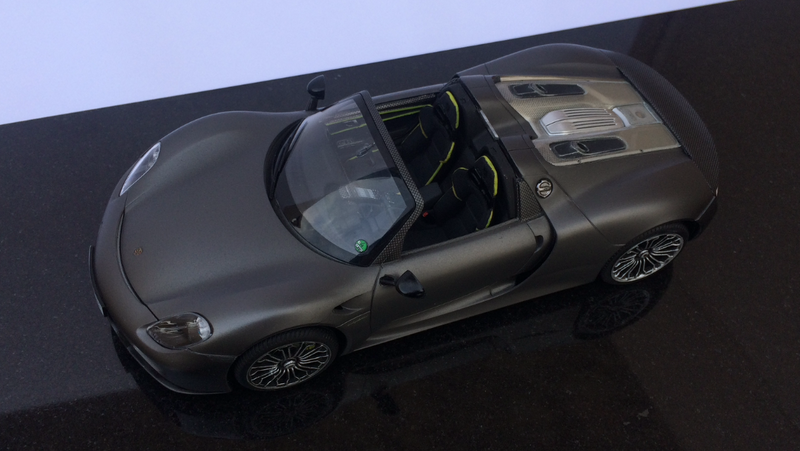 It’s a curbside model, but there is still a lot of detail in the front and back. This is unfortunately covered over when the model is completed. I looked at opening up the engine bay and the front of the car, but this would have been major surgery. In the end I just left it as is. It would be good to see Revell take their kits up a notch by incorporating opening boots and bonnets into some future releases. That’s trunks and hoods for our friends over the pond! I replaced the wheels from the kit with some resin ones from Plamoz. I accidentally pushed my thumb through the spokes of one though… so the rear right hand side wheel is from the original set. I think the difference in quality is plain to see. 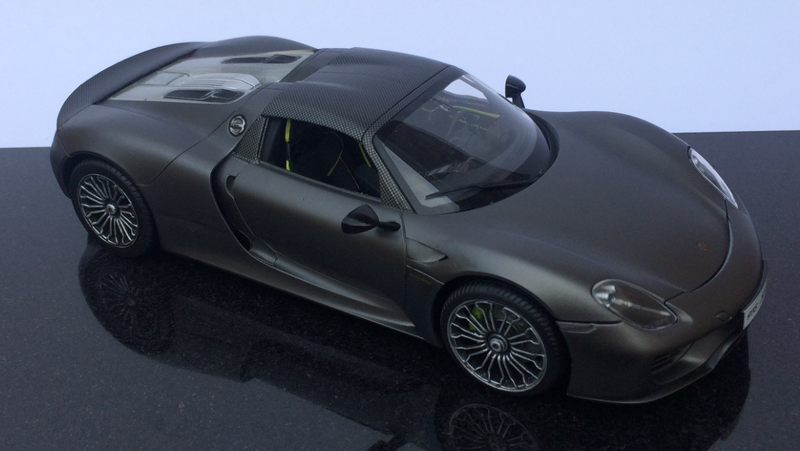 There are two versions of the car available from Revell. The standard car and the Weissach package. 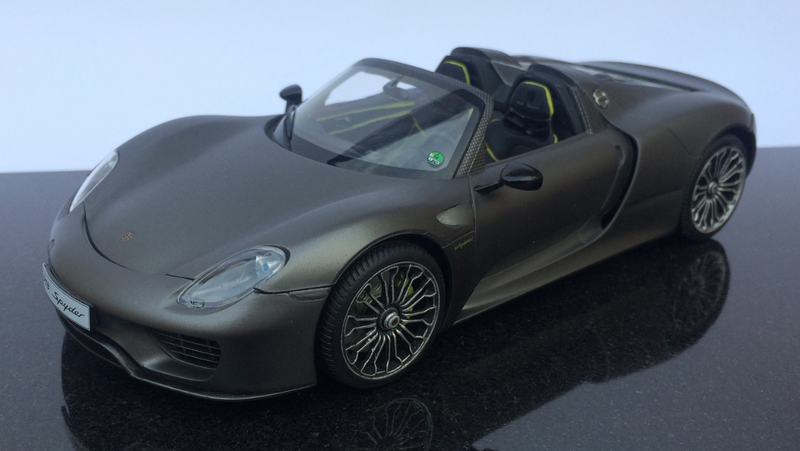 I had the standard kit version, but decided to do a bit of custom work with the carbon fibre roof, spoiler and interior which is standard on the Weissach package. 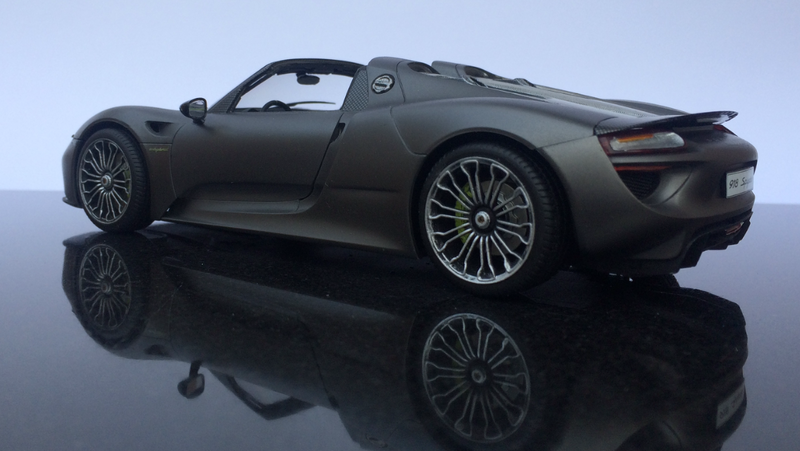 I much prefer the wheels from the standard 918 so kept them on my model rather than go for a full conversion. I did do a little bit of surgery and opened up the air intakes and out takes, replacing the kit parts with some wire mesh grill left over in the spares box. For the paints, I tried some acrylics from Gravity Colours. 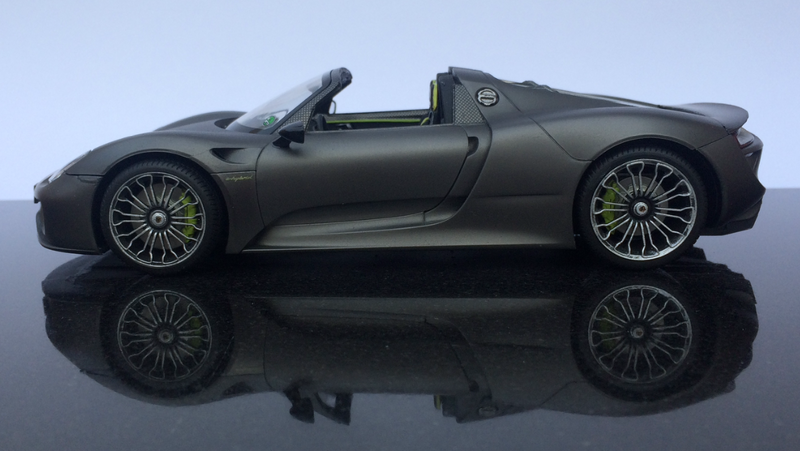 I used a dark metallic grey for the body work and a Porsche acid green for the brake callipers and the interior trim. They were good quality, but I found the grey went on a little bit grainy. That could have very well been my fault however… maybe the pressure was too high on the compressor for the paint. 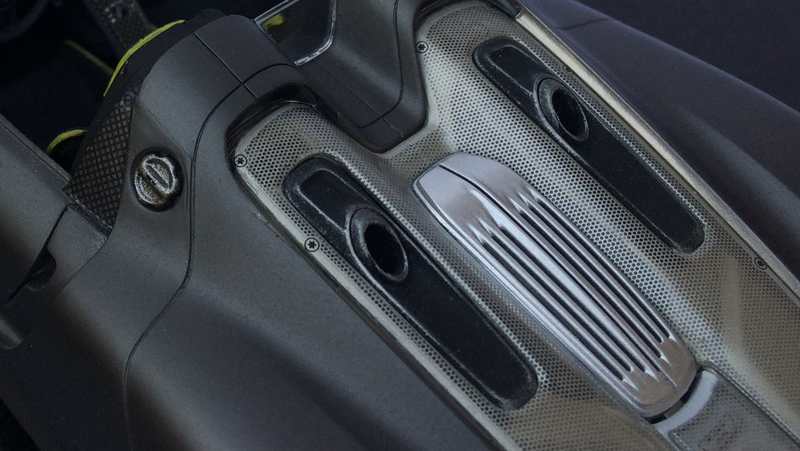 My favourite part of the kit is the metal cover at the back over the engine bay. It is actually a clear glass part with a decal to give the illusion that it is a single piece metal part. I think the end effect is very convincing and a really nice touch. If think it would be impossible to replicate the exact contours using photo etch. In conclusion I would say that this was an enjoyable build. It doesn’t have the level of detail seen in a modern Tamiya kit, but it still went together without any problems and I would more than recommend it to automotive builders. So now the bench is clear. If you managed to persevere through to the end of the article, you get to vote on my next build… Either the Eduard Su-27 or the Tamiya LaFerrari, complete with a work in progress! Which one would you prefer? As always folks, thank you very much for checking out my article, it is very much appreciated! What am impressive build !!! 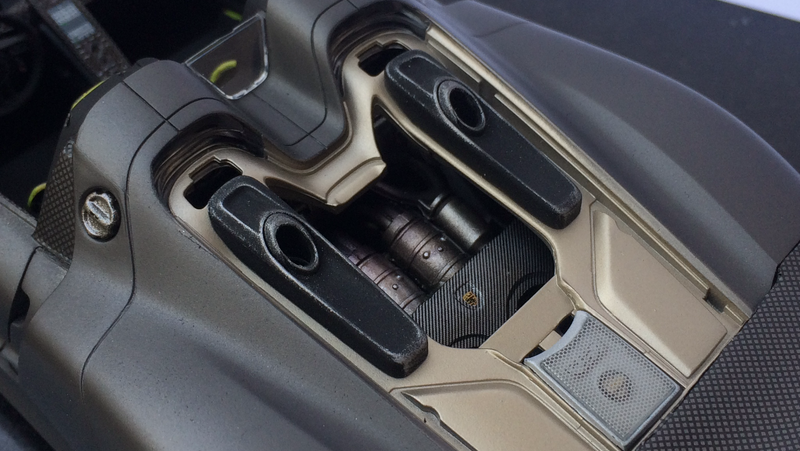 The carbon fiber and the rear engine deck are simply amazing …… I like the factory wheels too. My vote is for the Eduard Su-27. Fantastic work Richard. 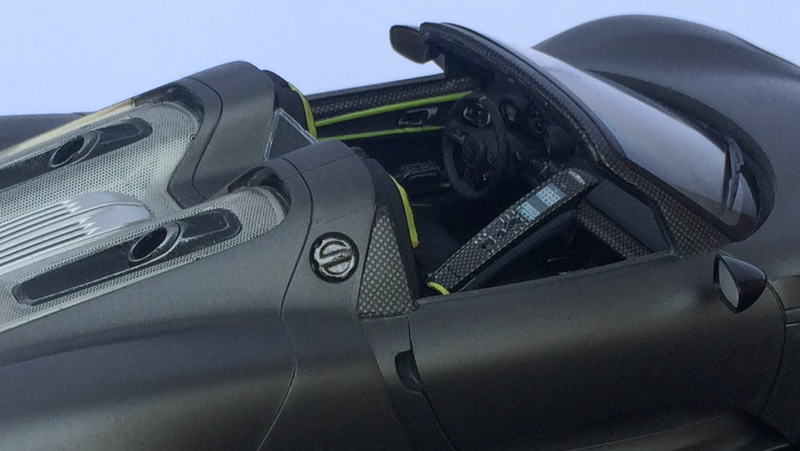 Great details and the car is even allowed to go into the german city centers with it’s green “4” on the windscreen. Like you mention it may not be the Tamiya quality, on the other hand Revell is still offering new car models to us builders. 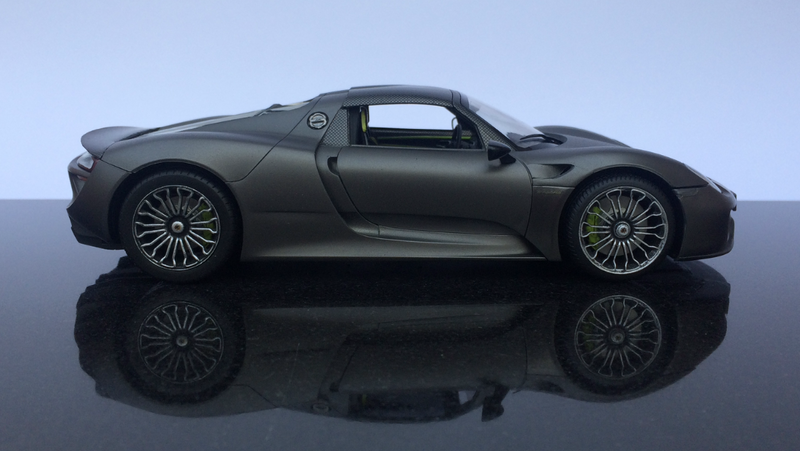 I like the color of the bodywork and the carbon fiber details, and great photos! Now for your next build, I like both subjects but would vote for the LaFerrari. Cheers mate, much appreciated! I’ll agree there, Tamiya don’t seem to be releasing a huge amount of new vehicle kits at the minute. You’ve definitely captured the look of this Porsche, Richard. I’ve stayed clear of Revell kits since having a couple of duds a long time ago, but this one definitely looks OK, there are some lovely details but I agree with you about the wheels. As for your next build I can’t decide, how about doing them both together? Cheers George, thanks mate. I think their newer kits have come on a long way recently. I had actually thought about doing that… We’ll see how the voting goes. I’ll class your vote as one for each, so that’s 3-2 to the plane at the minute! Richard, this is great! You’ve presented a gorgeous model of yet another car I can’t afford, but wish I could take out for a ride on the Autobahn. I DO miss driving on the Autobahn. Thanks mate. I did see a real one in the local Porsche garage a couple of years ago. It belonged to a company CEO and was in for a service… must be nice.. I took my last R1 on the autobahn. Lots of fun! Very nice! Since I’m an aircraft guy, my vote is the wingy thing! Cheers Greg, much appreciated! 4-2 to the plane! A real beauty!! Great job. Do the LaFerrari next. Thanks very much Robert, cheers! That’s 4-3… going to be a close one. Looks fast, looks expensive, what’s not to like. Great pics by the way. Cheers Tom, thanks mate. 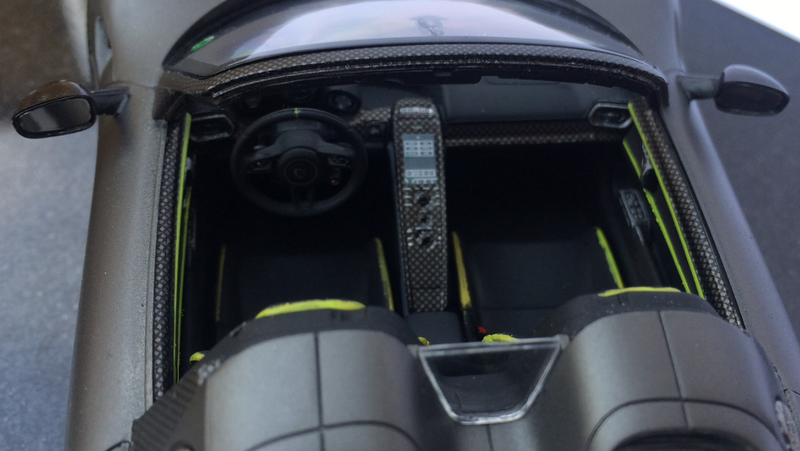 217 mph ( limited ) and £511,000 starting price. Most examples were sold for over £800,000 after customers started ticking the box for the weissach package. 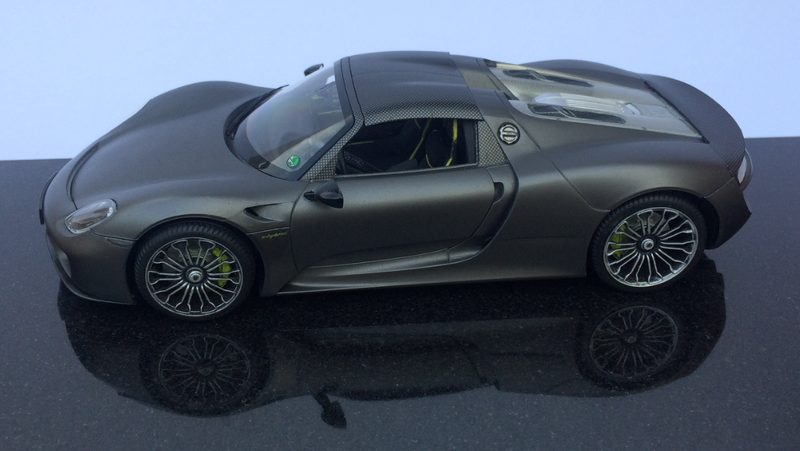 A very nice build my friend, did you know that only 918 cars were made..
Go for the plane, you know it makes sense. I didn’t know that mate, but I do now! I wonder how many have been written off! Thanks for the compliment! And the flanker has flown into the lead by 5 to 3. I watched a programme on supercars, and this was the featured car. A How its made prog. 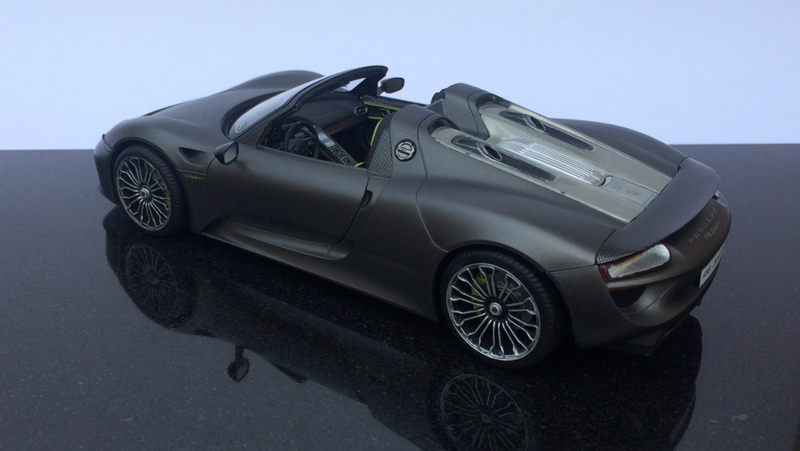 Richard, that’s a beauty of a Porsche – love that Matt black finish. I showed this to my son (he’s a car nut) and he thought it was a real car. In terms of the vote; go with the Flanker! That’s the flanker way ahead now. 6 – 3. Wow! I may rethink the mode of transportation I want to model after. Thanks very much Anthony! 7-3 to the flanker. Thanks very much! That’s 7-4 now!